The Urine Off Find It-Treat It Kit is an environmentally friendly BioBased cleaning product that safely eliminates human and pet urine stains on any type of surface. 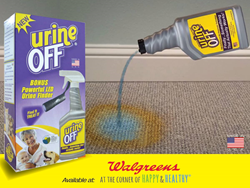 Urine Off is an environmentally friendly bio-enzymatic stain and odor remover. We are excited to have the Find It-Treat It Kit, readily available to consumers through a leading U.S. retail chain. Bio-Pro Research announced today that its Urine Off Find It–Treat It Kit is now being sold nationwide at more than 8,000 stores throughout the 50 U.S. states. The Urine Off Find It-Treat It Kit is an environmentally friendly BioBased cleaning product that safely eliminates human and pet urine stains on any type of surface. The product was developed by Bio-Pro Research. The kit also includes a state-of-the-art special wavelength Urine Finder light that allows the user to effectively locate and remove all urine stains not visible to the naked eye. The kit can be found in the As Seen On TV section of the store. The combination kit ensures that consumers treat the entire urine stain; first by finding the affected areas with the Urine Finder light, and then by treating all deposits with Urine Off. What makes Urine Off a truly effective urine strain remover are the powerful microorganisms that consume urine components, completely eliminating stains and odors. It is safe to use around people and pets with no harmful side effects. It even remediates old, set in urine deposits. The kit includes two cleaning dispensers, one for carpet and fabrics and a sprayer for hard surfaces. The Urine Finder light makes it easy to find and identify old and new urine deposits (such as cat urine, dog urine and human) anywhere urine can hide. It employs state-of-the-art forensics technology made public in the wildly popular CSI TV series. This Urine Finder is a miniaturized version of the same technology that Bio-Pro utilizes in its ultra-high power professional equipment used in healthcare, eldercare, hospitality, transportation, janitorial, and veterinary industries. Urine Off is Bio-Pro Research’s premier product and is distributed worldwide. It has been tested and certified for use on commercial airline lavatories, is certified by the Carpet and Rug Institute, and is USDA BioPreferred Certified. Urine Off is also the official ring cleaning product for Crufts, “The World’s Largest Dog Show” as it prevents dogs re-marking a spot which has been previously cleaned by the product. Bio-Pro Research, LLC, is a privately held company that produces bio-enzymatic stain and odor technology for consumer and industrial uses. Users include healthcare, eldercare, sanitation, aviation, hospitality and the pet industry. The company sells its cleaning products in over 84 counties. Bio-Pro Research CEO, Bill Hadley, was appointed a Faraday Partner in science and technology to the United Kingdom, and has lectured globally on bio-technology applications in environmental health and facilities sanitation. Learn more about Urine Off at http://www.urineoff.com.